Located in Mae Sai, Phet Ngam Hotel is in the business district, within a 15-minute drive of Wat Phra That Wai Dao and Maesai Customs House. Featured amenities include multilingual staff and coffee/tea in a common area. Free self parking is available onsite. With a stay at Island View Bungalows in Koh Samui, you'll be within a 15-minute drive of Big Buddha Statue and Bangrak Beach. Free self parking is available onsite. With a stay at Siamese Gioia Residence in Bangkok (Sukhumvit), you'll be within a 15-minute drive of Suan Pakkard Palace and Pratunam Market. Free self parking is available onsite. With a stay at Green View Beach Resort in Satun, you'll be just steps from Koh Lipe and Ko Lipe Pattaya Beach. Featured amenities include express check-in, multilingual staff, and luggage storage. 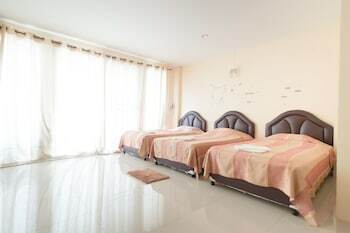 Located in Chonburi, LUXURY GUESTHOUSE is a 1-minute drive from Bangsaen Beach and 9 minutes from Burapha University.